A style synonymous with the Roaring 20s, Art Deco appears poised to make a comeback in 2019 and into 2020 — the next 20s era. Here's how the style is influencing products at Las Vegas Market and the winter market circuit. You know farmhouse when you see it, but how easily can you spot an Art Deco-inspired piece? If you're at Las Vegas Market, then you're probably seeing a lot of new Art Deco intros. So how is Art Deco making its mark on Las Vegas Market? Here's what to know about the style itself and how to spot it while you're walking the halls of Las Vegas Market. Before we can discuss Art Deco's influence on today's designs, it's important to highlight the context and key details that separate Art Deco from other stylings. The Art Deco movement started in the 1900s and lasted until the beginning of World War II, though it is most often thought of as being of the 1920s. In the early 1900s, mass production became commonplace, which ushered in a whole new crowd of consumers who could now afford more goods. While this was a positive in many ways, artists and designers worried the one-of-a-kind touches and artisan styles would be lost, which led to the creation of the Art Nouveau and Arts and Crafts styles. Art Deco didn't shun mass production. Instead, the movement's goal was to make those mass-produced products more aesthetically appealing to consumers by adding artistic embellishments, allowing them to have beautiful pieces that wouldn't break the bank. In the U.S., one of the best examples of Art Deco design is the Merchandise Mart in downtown Chicago where Casual Market is held every September. The pyramid on top of the building and the carvings represent the cultural obsession with Egypt that gripped the U.S. and much of the world when the Mart was built. In 1922, archeologists discovered King Tut's tomb, and the carvings and designs became all the rage. That, in turn, inspired architects to incorporate symbols and shapes related to Egypt, which is why the Merchandise Mart is topped with a pyramid. Of course, not all Art Deco patterns are Egyptian-inspired. Mesoamerican, African and Roman styles also influenced designers. If you're walking the halls of Las Vegas Market, it's likely that you'll see Art Deco influencing everything from furniture to lighting. Here's how to spot it. 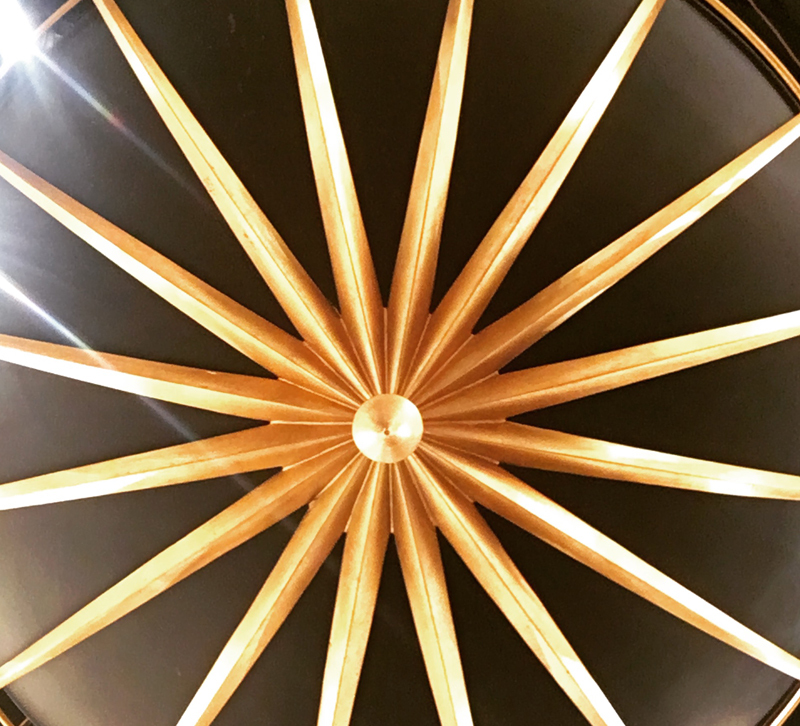 - Black and gold: At Lightovation, this pair was all the rage, and really, it has been for some time. Black and gold fixtures have been the favorite finish pair, according to many manufacturers, and when paired with simple lines and geometric patterns (think Chevron or zigzag). With Matte Black being the big finish at Lightovation last year, it makes sense that gold accents would be the next step (see the Currey chandelier above or Denise McGaha's collection for the company). - Few curves: Art Deco relies mainly on straight lines, which were easier to mass produce. Where Art Noveau was more organic, Art Deco celebrated the Industrial Revolution and embraced materials such as plastic. - Ornate in architecture, simple in furniture: As mentioned, Art Deco buildings were often adorned with intricate carvings inspired by Egyptian, Mesoamerican, African and Roman styles, but that mostly extended to architecture only. When it came to furniture, simple lines and new materials reigned supreme. How are you seeing Art Deco represented at Las Vegas Market? Share with us in the comments!